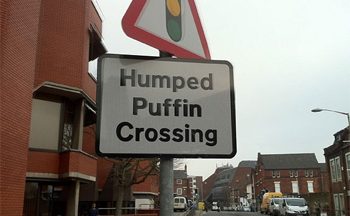 As you can see from the picture and the title of this little blogette there is indeed something rather special about Chesterfield in the UK and that is the existence of Humped Puffins, yes that is right apparently Chesterfield has a thriving community of Humped Puffins and is as far as I know the only place in the world with any Humped Puffins at all. To be honest I didn’t know that there we such creatures but what do I know there are, and it would seem (again from the picture) that they enjoy crossing roads. I wonder if they have other hobbies?